1. Name one person who made you laugh last night? my co-nurses ate rose and ate shallamar..laughing trip kami last night sa work..!! 3. What were you doing 30 minutes ago? sleeping just woke up eh!! 6. How many beverages did you have today? i just woke up and i am currently drinking a glass of orange juice right now. 7. What color is your hairbrush? black. 8. What was the last thing you paid for? craving for chocolate cake...so stopped by ralphs grocery (it was the only open bakery..11pm na kasi) and bought one.. not bad for a grocery store cake..it was so chocolatey moist!! 9. Where were you last night? spent my whole 7pm to 7am at the hospital working. 12. What’s the weather like today? sunny good for a fall season weather..
14. What excites you? paycheck every other week!!! 20. Do you make up your own words? yup always!! 21. Are you a jealous person? i try not to be...but if i have a reason to be jealous syempre i am!! 26. Do you chew on your straw? yup...bad girl!! 29. Who’s the rudest person in your life? yung registry nurse sa amin...LF ang initials...super rude!! 30. What was the last thing you ate? cinnamon raisins bagel with cream cheese right now!! 31. Will you get married in the future? married na po!! 34. When was the last time you did the dishes? last night!! 35. Are you currently depressed? No. 38. Tag 5 people who would do this survey: pardon me..but i haven't been checking blogs for few days now..kaya hindi ko alam kung sinong hindi pa nakaka-answer nito..so this one is up for grab by anyone!!! thanks to peachy for this tag!! since christimas is coming right up, are you planning to give your husband a gift? If yes, what are you going to give him? i'm happy that i'm able to finish a layout..!! liked the color combination of lime green and pink!! very girly-girly!! ang sarap talaga mag scrapbooking..mostly if you get to see our finish layout!! at least i finished this one!! It's been months since i did my last layout. I've been trying to do one, but i just can't finish it. and luckily i finished this one...!! it's not really the look that i want but it's close!! pardon my artistic talent on this one...since i lost my mojo in scrapbooking, it seems like i need to retrain my eyes again!!! i think i am in a state of hibernation..!! I've been lazy like crazy!!! I don't know if I should blame the slowly coming cold weather or that nothing really exciting is really happening to my life right now!!! gotta go now...i'm going back to bed...!!! I wanna thank Tere for my first ever Halloween treat! to pass the love..anyone visiting my blog can grabe this treat!!! i always see our pet therapy dogs walk around our hospital eversince i started working there. but since i work with the newborns, our department is the only floor they can't come...kaya i never had the chance to pet them!!! but today is a different story....when i saw them walking down the hallway...i took initiative to stop by and play with them!!! they are such trained dogs, very calm and they are used to being touched!!! kung ganito lang lahat ng dogs..!! !they don't bark, lick, and mostly they don't bite!!! buti nalang my phone is in my pocket, kaya nakasingit ng ilang pictures with them!!! studies have shown that pet therapy program in a hospital helps patient recover faster!!! Well for a nurse like me, it lessens my stress of the day, even though i just spent few minutes with them!! they not only do therapy for the patients, they do it for the employees as well!! i was browsing in the message board of n@w and read this one post regarding one line from desperate housewife that was aired last sunday. just to be curious i clicked on the link and read and watched the video clip of the so called "controvercial line"
unfortunately, they somewhat insulted medical professionals that graduated from the Philippines. coming from the medical field, this really hit me hard!! I know i graduated nursing school here in the US, but let me tell you filipino workers, not only doctors and nurses, but all, in the hospital here in the US are known to be the best workers noh!!! We are the ones that do the the best bedside care to our patients. ewan ko, but i am really irritated about that insulting line!!! not just we graduated from another country, does not mean we are less of a professional!! watch it and let me know what you can say about it!! 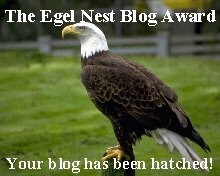 Thanks to my sis Nita for passing this award to my site!!! hopefully soon..makapunta din kami doon!!! while we were with my in-laws...mom and i decided to have a mother daughter bonding...so what else to do....SHOPPING!! we left our husbands at home and we went to the nearest mall from their house. I ended up buying 2 sweaters, 1 turtle-neck shirt, 1 while polo shirt, and flat black shoes!!! then mom got 1 sweater and white polo shirt. oh diba...shopping to the max talaga kami!!! when we got home daddy and eric both said "delicado talaga magsama itong dalawa..mauubos pera natin!!" hehehe...as you can see i am one of the lucky ones to have such a loving relationship with my in-laws....they are actually my second parents...kasi pag-pinakikila nila ako..youngest daughter daw nila ako!!! no choice as of now I am the only daughter they have..puro kasi boys sila eric eh!!! gotta go.....still suffering form my viral colds and cough..but it's getting better! !